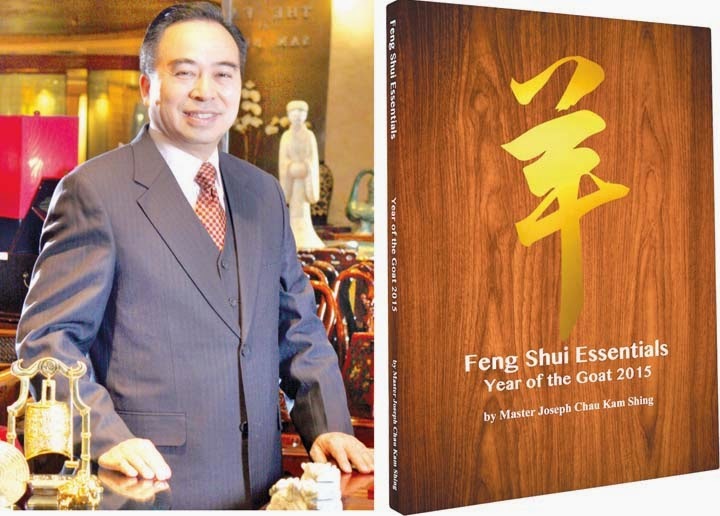 The world-renowned Feng Shui expert Master Joseph Chau Kam Shing has just released his very first Feng Shui book, Feng Shui Essentials: Year of the Goat 2015 (published by Manila Bulletin) on December 16, 2014. His feng shui forecast for the Chinese New Year, published as a special supplement in the Manila Bulletin newspaper, has been followed for over a decade already. Here is my special interview with Master Joseph. 1. How did you learn Feng Shui, Geomancy, etc? What were your influences? Master Joseph (MJ): I study Feng Shui since I was teenager. I was interested to read books about fortune telling - the 4 pillars in Feng Shui. Later on, when I discovered that some knowledge I did not understand, then I started to look for experts and Masters to follow. Eventually, I have followed five Masters to learn the knowledge. In fact, through Feng Shui, I am able to help people enhance their luck and change people's living conditions. 2. When did you decide that this is something that you like to do? How long have you been practicing this? MJ: I planned myself to be a Feng Shui Master since I was teenager. Now, I have over 30 years of experience. 3. How do you interpret your forecasts for the coming year? MJ: Every year, I do my prediction for the year based on the person's birthday. Year 2015 seems good, but in fact there are so many hidden problems existing in society. Economic situation is going up and down. It is easy come and easy go. Industries that will prosper are Real Estate and Construction. Garment, fashion, furniture will be saturated. Banking, car sales, medical, minerals, law firm, TV show and entertainment business will face many challenges. Tourism, hotels, trading, transportation, logistics, restaurant, electronics, telecom and jewelry business will face many competitions. Regarding health, people will suffer from afflictions of influenza, epidemic, respiratory system, asthma, lung, heart, brain and high blood pressure problems. Natural catastrophes such as acts of violence, flighting, robbery, super typhoon, big fire, train accident and landslides will occur in various parts of the world. On love affairs, romance life is smooth-sailing. It is full of varieties and enriching. 4. Can you already interpret one's character/ attitude/ directions even if you just meet the person for the first time? MJ: I can know something, but not all. 5. Since you are into feng shui, can you avoid bad things from happening? MJ: Yes, I can avoid bad things from happening, but there are many external factors that will affect the results sometimes. 6. What was/were your notable prediction/s in the past that came true? MJ: Many things came true in 2014 and also the other year, but I am not fond of counting like other people. 7. What can you say about the following areas for the Philippines for 2015? MJ: Business is full of competition, but it is the same as no. 3 I mentioned. MJ: Arts is saturated. Entertainment business will face many challenges. MJ: No comment in politics. MJ: Education need to improve and change the systems. 8. When you deal with people, do you ask for his/her birthday for interpretation? 9. What are the things you need to know for you to be able to interpret something about a person? MJ: The correct birthday of the person. 10. On p. 92 of your book, how accurate is the Fertilization Table of the Royal Family in the Ching Dynasty? What was so special about this dynasty? MJ: It is 90 percent accurate. It has been proven by many of my clients and people in the olden days of China. It was used by the Royal family before during the Ching dynasty. 11. Just curious, does the Fertilization Table still apply to the present day? Do we have personal accounts that prove that it can still be applied? Some doctors believe that the gender of the baby can be done depending on the position of the sexual act. Do you believe in this? MJ: The table is still popular and being used today. But there is some secret in sexual affairs. 12. Mary Jean "MJ" Lastimosa is our representative to Miss Universe 2015 happening on January 25, 2015 in Doral, Miami in Florida, USA. What is your forecast on her? Will she make it to the Top 15, Top 10 & Top 5 elimination rounds? Will she bag a special award? MJ: I don't know her. How can I do the prediction?